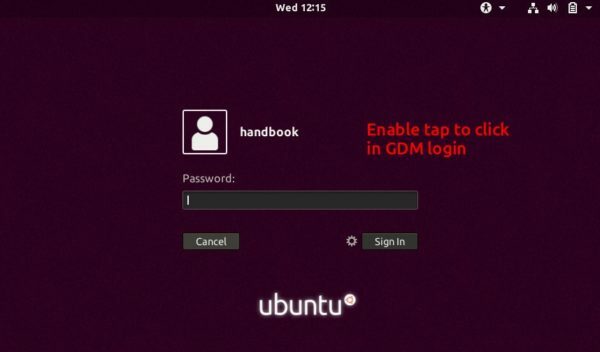 Tested Ubuntu 17.10 beta 2 recently and that the touchpad ‘Tap to click’ feature does not work in my laptop while I’m in the GDM login screen, even though it starts working once logged in. If you get the same problem and want to re-enable the ‘Tap to click’ feature in login screen before Canonical adding it back, following steps will tell you how. You can enable ‘Tap to click’ either in Settings utility or via gsettings command. For working in the login screen, you need to do it under the gdm user. Type in your password (no visual feedback while typing) when it prompts and hit Enter. xhost: unable to open display ":0"
The command is not required in the default Wayland session, just skip the step. following the first gsettings being still gdm user. Thank you! It worked perfectly.